Today on Alphabet City: Jon Paul gets emotional over a celebration with co-stars, friends & family. Last night, I once again channeled my inner-Mary Tyler Moore to hold it together as I thanked co-stars, guest stars, featured actors, crew members and, of course, friends and fans at the official Alphabet City: My So-Called Sitcom Life Book Launch Party. 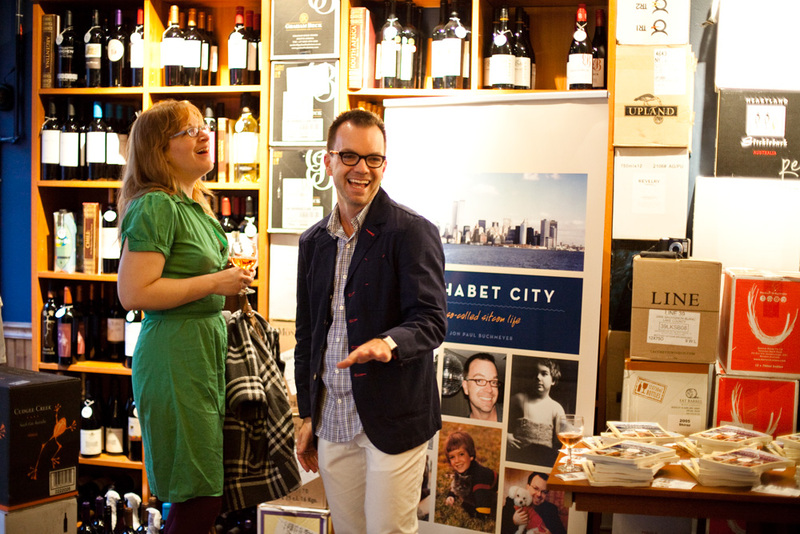 I couldn’t have created a better set than the Alphabet City Wine Co.—featured in today’s New York Times. Here’s a little Flip video of my remarks courtesy of co-star Angela. Or read on below for a summary. But seriously, everyone there—and reading here—has helped me get to this point because you’ve provided encouragement. And you can’t underestimate how much encouragement means to an artist and an author. It’s tough staying true to your work, dedicating time and following your dream. I’ve had the opportunity to follow my dream three times now. First, becoming a filmmaker by writing, directing and producing GayTV: The Movie. Second, living in the city of my dreams—New York City. And now third, being an author. This third time has been the sweetest, really. Because there has been someone there for me supporting me and nurturing me the entire time. Chef has loved me and loved that I was following my dream. Thank you, Chef, for being such a great foil and partner—after nearly ten years together, you’re the most amazing co-star I could ever imagine! 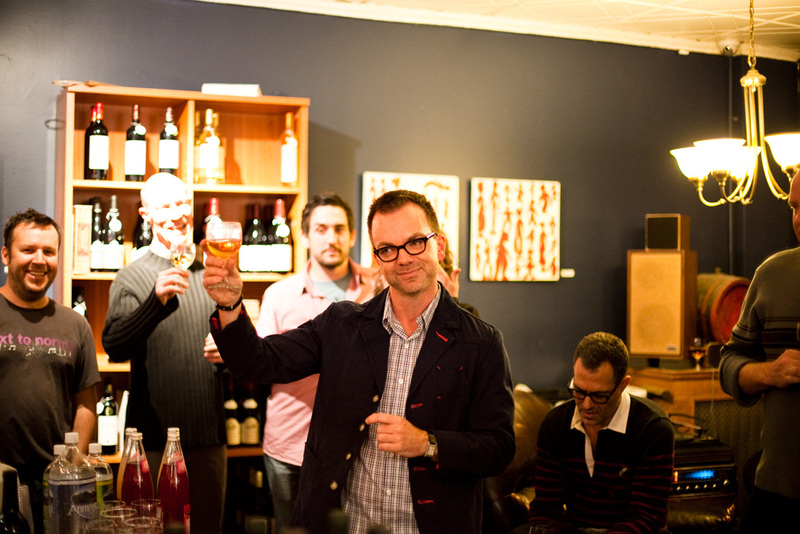 And so, a virtual toast to all of you—thank you for being such an important part of my sitcom life and helping me turn the world on with a smile. See you on book tour! UPDATE: A few photos courtesy of Jamie at from FromMe-ToYou. Like a celebrity on the red carpet, folks keep asking me about my outfit. My super cute navy blazer with the red accents–Brooklyn Industries! Glasses by Paul Smith. Shirt & Pants by Parke Ronen. With my friend Clare in front of the blow-up of the cover that makes me laugh. Today on Alphabet City: Jon Paul recalls bittersweet memories of automatic urinals and Lesbian Folk Singers. The first time I came head-to-head with an automatic flushing urinal I was disgusted. It was 1988 and I was just finishing up my first date and second semester as a freshman at the University of Texas at Austin. Stephen, the nerdy cute junior I had been madly flirting with for months at the gay gathering place just outside the Student Union, had finally asked if he could buy me a cup of coffee at the Cactus Café inside. Unfortunately, the “date” didn’t go so well. It was open-mike night at the dark little venue that featured a small stage for live music performances and bad poetry readings. That night, I had a hard time focusing on my crush Stephen, and not because he spent most of the evening regaling with me his sexual exploits in the men’s toilets of a bathroom in another campus building. Odd fodder for a first date, but I made a mental note to check out the scene. No, I was distracted by the improvised tunes from a series of never-ending performers straight out of Slacker Austin Central Casting—earthy crunchy women with stringy hair and out-of-tune guitars. Other than listening to Joan Baez records on long car trips with my Dad, I had never been exposed much to folk music, and based upon what I was hearing, wasn’t sure it was my favorite genre. Although, years later, the performers became the basis of a character called Lesbian Folk Singer in my film GayTV: The Movie played by one of the founder of the Dixie Chicks, Laura Lynch. That night, I excused myself to the bathrooms just outside the bar. After relieving my bladder, I was flummoxed by this new contraption facing me. There was no handle to flush, and a large sign explaining that the Student Union was testing this new technology in order to make our lives easier. Well, I was disgusted that our student fees—taxes, basically—were being wasted on such a silly concept. Why not spend it on an education campaign teaching men how to behave appropriately and flush it themselves? Ah, youth. How sweet, and how naïve. But so far, no one has remarked on the once cutting-edge urinals of the Cactus Café, or worried about what will happen to the Lesbian Folk Singers. Today on Alphabet City: Jon Paul takes matters into his own hands becoming a self-made/published man. You can say that again. Everyday there seems to be another disheartening story about “the end of books.” Quite a depressing thought for a writer who’s always dreamed of seeing his name in printed letters. People keep encouraging me to move on from type—and focus online. No doubt, this blog has given me an enormous boost of confidence about my storytelling prowess connecting with readers. Believe me, I need that pick-me-up after the number of times I’ve heard from literary agents, “I just don’t find your narrative voice engaging.” Turns out, hundred of daily readers of this blog are proving them wrong. The conundrum of print vs. online reminds me of when I was interviewing for a job at Condé Nast in the late ‘90s just as the Internet boom was taking hold. Friends told me I was crazy to consider going to “old media” when the dot-com boom was all the rage. But I just couldn’t shake my dream of working for a publishing giant—it seemed like what a Mary Tyler Moore wannabe would do. I’m glad I followed my MTM gut instinct that time, and I’m going to do the same now. I’ve never been one to sit back and let others control my artistic development. When I wanted to get into movies, I made my own film GayTV: The Movie. 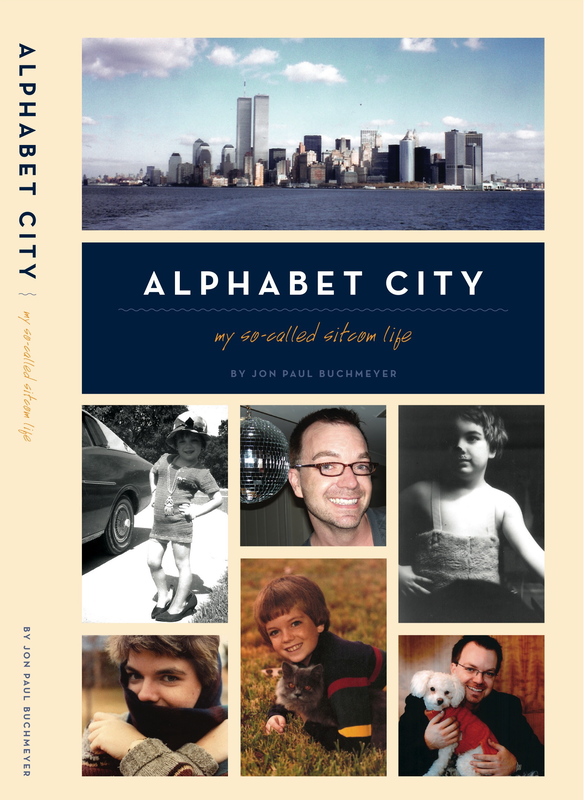 So now, I’m publishing my own book—the magic of the Internet allows me to get Alphabet City directly to your hands. There are a lot of decisions to make, and that’s where I need your help. Take a few moments to answer some survey questions for me on format and pricing. Now stand by as I make a few finishing touches on the manuscript and cover artwork. As I round the corner to my 41st birthday, the book will be a gift for me—and hopefully you. And I think that would make my role model Mary very proud.